For the races this year I was basically looking for that flawless base and a clean contour. I wore an all black outfit so I wanted a bold lip, a little flush of colour on the cheeks and a small amount of highlight for a natural glow. I firstly cleansed with my Elizabeth Arden Visible Difference cleanser and followed with L'Oreal's Hydra Genius. This cleanser offers such a good base for makeup and the Hydra Genius has been a favourite over the last month or so. Moving on to makeup I started with the Smashbox Photo Finish primer in my t-zone and in the pores. I've been making a conscious effort not to skip this step recently as it really does make a difference. Next is a relatively new step in my makeup routine - Contouring before my foundation. I know this isn't revolutionary but it is for me. I use the contour shade from the Smashbox Contour Sticks in the hallows of my cheeks, on my forehead and in my temples and after that I added a small amount of Dew The Hoola to my hairline for a natural finish. I added a spritz of De-Slick setting spray and moved on to my foundation. Another new for me is the Rimmel Match Perfection foundation. I've seen Fleur de Force rave about this for years but never believed the hype until I picked it up a little over a month ago. I absolutely love it, it's so buildable and gives such a natural finish. I used the concealer from the same range to cover my dark circles and blemishes and finished off with a dusting of the new Rimmel Insta Fix powder. This powder is a lot more matte than I would have usually gone for but as I needed my makeup to hold well for at least 9 hours, I knew it's what I had to do. To finish the face off, I first added some Hoola Bronzer into the hallows of my cheeks, under my jawline and around the temples to compliment the contour. Then, to give myself a healthy and youthful glow, I flushed my cheeks with the gorgeous Galifornia which left me with enough radiance to not need highlighter. As I mentioned earlier I wanted to my eyes to look clean and classic. I opted to run a light warm tone from my Morphe 35F pallet through my crease to compliment my bronzer and then used a slightly darker colour as a discreet cut crease. I then added a light shimmery shade onto the centre of my lids for a youthful, more awake look and also made sure to put this in my inner corners to make my eyes pop. I moved on to my go-to Collection Fast Stroke liner to give me the sharp wings that I wanted and made sure to tight line my upper lash line so there was no skin showing. I used the waterproof Lash Sensational to ensure my mascara would stay on my eyes all night. Lastly I filled my brows in with NYXs Tame and Frame brown pomade and finished them off with Gimme Brow for definition. I cleaned up around the edges of my brows with the Match Perfection concealer for a sharper look but I left the inner thirds so they didn't appear drawn on. I also added some of the Fleur De Force Fleur Loves lashes over top. Simple yet effective. Last but not least, my lips of the evening. As I was going for a classic look, I knew it had to be a red lip but I needed something that was going to see me through endless glasses of wine and cocktails. After adding a few pats of the Eight Hour Lip Repair, I chose the red shade from the Rimmel Exaggerate Lip Liner range because it gives such smooth and creamy base but doesn't allow the colour on top to bleed. This colour is also opaque enough that if you wish to over line your lips, you can do seamlessly. 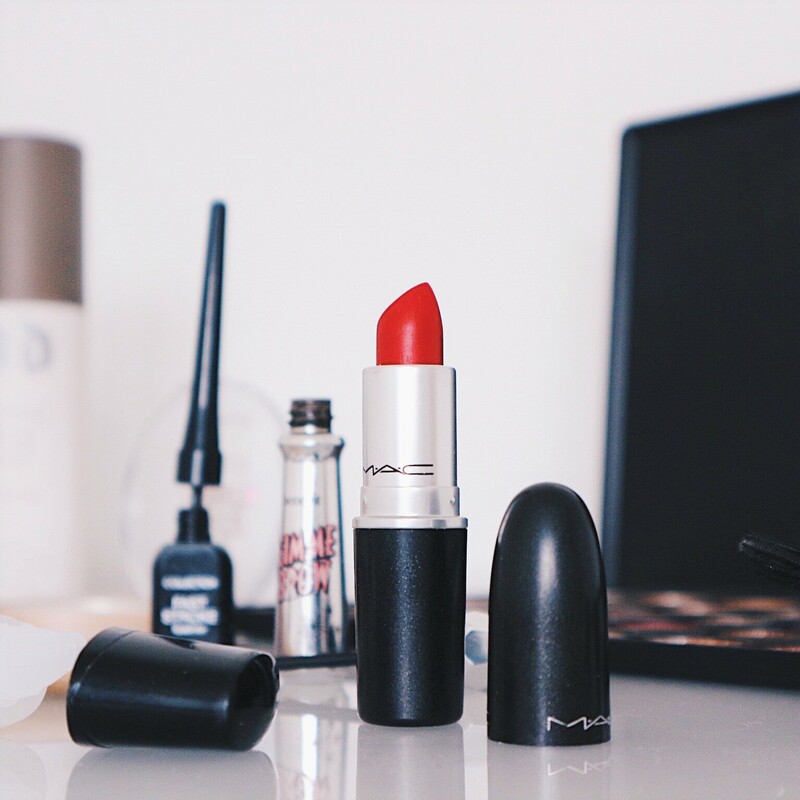 Over top, I opted for the staple Ruby Woo from MAC. It's matte enough to not dry your lips out but enough to allow everything to stay in place. I finished with another spritz of De-Slick to make sure everything stayed in place. To summarise, my look was a classic winged liner with a red lip and sculpted cheeks. I absolutely loved this look and received so many compliments on the night. Let me know if you enjoyed this style of post because I'd love to do more in the future.